Table manners, dining etiquette and proper ways to host a dinner party might might seem to some as much of a lost art as duelling, blacksmithing or going fox hunting. To author Lynn Rosen, however, the traditions and lore of the dining experience are vital and necessary. 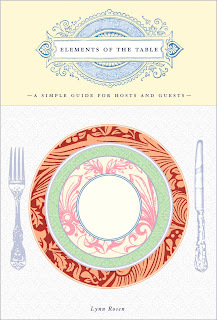 Her book, Elements of the Table (Clarkson Potter) is a witty primer on proper dining etiquette. The work is full of fascinating and useful information, history and instruction. 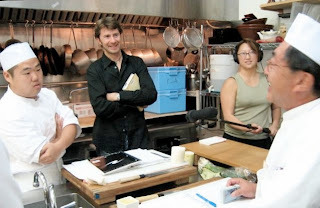 Ms. Rosen was nice enough to check in with this site about her book, her own dining experiences and why her friends might be nervous about invinting her over for dinner. M & L: How long had you thought of writing this book? LR: "I have long been obsessed with table setting. As I say in the book, it was one of my main household chores as a girl, and my mother was very strict about my doing it just right. It occurred to me that I could turn my obsession into a book a few years ago. I began shaping it, wrote the proposal, and was lucky enough to have Clarkson Potter want to publish it!" M & L : Were you surprised that there was enough material to construct an entire book about this subject? LR "You should see how much material my editor cut! However, from the start, Elements of the Table was meant to be a brief and practical book. I never doubted that there was enough info to fill a book about how to use all the items on the table, because there are so many of them, and so many of them befuddle us! What did surprise was the richness of the history of dining I found. I was completely fascinated by the historical aspects of how we eat, and read every book I could find on the topic." M &L Was there any bit of information that surprised you in the research or writing of this book? LR "What really surprised me was that my mother wasn't making this stuff up! I was surprised how steeped in history our table customs are, and how deeply important doing things the right way is to so many people. Also, lots of the specific historical tidbits I turned up surprised me. Like that people used to collect lots of silver tableware as a way of showing off how rich they were. Or that people did not wash cloth napkins very often, and used napkin rings to identify their own dirty napkin from one meal to the next. Or about how key historical figures had a role in something table-related, like when Count Richlieu dictated that table knives had to have rounded tips so no one could stab him at dinner! Fun things like that!" M & L: The photos and illustrations are very striking. What kind of input did you have in this respect? LR "Thank you! Well, I became a photo stylist for this book! I arranged all the stuff you see in the photos, set the tables, ironed the linen, held lights, and more! I was lucky enough that some wonderful companies agreed to loan me all the beautiful products in the photos. (Alas, like Cinderella, I had to give them back at the end of the shoot!) Then I persuaded my parents to loan me their dining room. I told them it would be for a few weeks but it wound up taking three months. And then I had two fabulous volunteer photographers: my father Walter Rosen (a talented amateur) and my friend Patrick Snook, who really is a professional photog, but usually shoots people and not plates. We just tried a bunch of stuff, consulting with our great art director Marysarah Quinn at Clarkson Potter, and found the right look. Glad you like it as it was a lot of work!" "As far as the illustrations, I envisioned the look I wanted and they were brought to life by another talented artist, Sherry Berger." 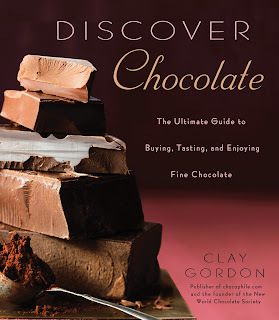 M & L: Has writing this book changed the way you view going to a restaurant or eating at a friends house? LR: "Well, my friends don't invite me over anymore because they are afraid I am going to grade them! Just kidding! They do get a bit more nervous when I come over than they did before I started writing this book. The most important thing I learned from my research for the book is that, if you see something done wrong at a friends table, just keep quiet about it. Don't complain, don't rearrange the setting, just deal with it. I would never insult a host by criticizing. But mostly I don't need to. Everyone entertains in a different way, and I just like seeing everyone's different styles and appreciating them. As far as restaurants, I am pickier. If I am paying for service, I expect it to be good. I worked for a caterer for a while, and I know how hard it is to provide good service. So now I notice how I am being served, and I can tell if it is being done right." "I attended a wedding recently at a fancy hotel, and the server at my table was excellent. She did everything right (for example, served from the left, cleared from the right), and did it pleasantly and unobtrusively. When the meal was over I complimented her and thanked her for her service. She seemed surprised to have been noticed and grateful for the kind words. 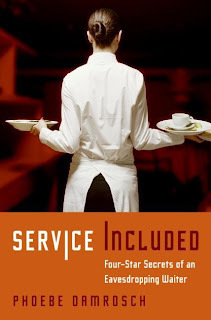 But if the service had been bad, I wouldnâ€™t have said anything." for sushi has, in turn, influenced us. 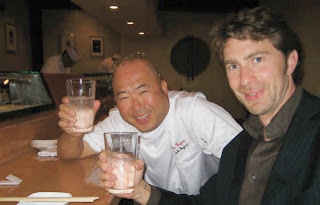 the history of Sushi-Why do you think this is the case? right -- and I was fortunate to have invested several years of my life into living in Japan and learning the Japanese language, so I was able to bring a lot of new information from Japanese sources to a Western audience. coasts. 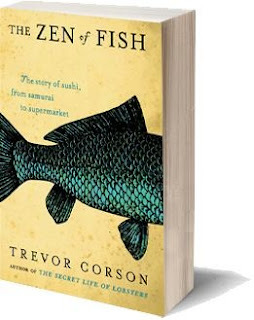 The amazing thing that is happening these days, which I describe in the book, is that sushi is now exploding in popularity in the American heartland as well. It's spreading like wildfire across the Midwest. sushi we'll be eating in the future. But as readers learn in my book, the word "sushi" refers simply to rice seasoned with vinegar and a little sugar and salt, so anything served with that rice can be sushi. The possibilities are probably endless. The Barbary Coast is a legendary bar in Wilmington, NC. As I remember, it was founded by a suitably colorful character in Port City lore: Tugboat Captain/Prizefighter "Buddy" Best (who was a client and friend of my Attorney Father WK Rhodes Jr.). In my twenties, the bar was a great haven because it had cheap beer, a great jukebox and a surprisingly cheerful, attractive staff. It's rougish repuation was well-earned, but it was much less dangerous than people percieved (mainly because owner Paul Best, son of Buddy, ran a tight ship and would not put up with any roughhousing). The result of this was probably the world's most comforting dive bar. On my recent trip to Wilmington, I pulled in to see if the bar was the same. When I walked in, I was almost nailed by a dart as some guys were playing at 3pm on a dartboard next to the entrance. As I sat down and ordered a PBR it occurred to me that the place had not changed a bit (except for the Barbary Film Festival nights and free wireless internet access)-Great stuff here! As recently as a couple of years ago, you could walk into the Dixie Grill and experience downtown Wilmington as it was circa 1950. The grit, the layers, the menu, the pool table, the ex-cons all spoke to the tough seaport town that Wilmington was - and the Dixie was both a reminder of Wilmington's less genteel traditions and a rebuke of the attempts to gentrify the downtown area. The Dixie was so tough (and smelled like grease and fire) and oozed so much integrity (among other things) and gritty charm that if it were in another city like NY or a smaller, somewhat sophisticated place like Raleigh or Charlotte it might have found a hipster following. Hipsters in Wilmington never really picked up on the place (possibly because there are so few hipsters in Wilmington). But, it had a consistent blue collar following and a colorful staff (Bunny, one of the waitresses was cast by David Lynch in Blue Velvet-the woman who dances on top of the car). It was only a matter of time until the Dixie got a facelift (this being Wilmington after all). According to one of the waitresses, the establishment closed for a few months at the beginning of this year and has just re-opened. The place is cleaned up (the smell is gone) and the menu is more healthy (the chopped salad is especially good) and the waitstaff is younger, but not as colorful. The large interiors of the place remain intact and there are nice touches here and there (an old sign from the 70's was apparently drug out and mounted behing the bar). As with many places in Wilmington, the service is a genuine problem. The waitresses/waiters aren't rude, just out of it and distracted. We were the only ones in the restaraunt but it was like pulling teeth to get served. There were problems getting the check at the end of the meal and when I asked for a shot of vodka, the waitress brought me an orange juice glass full of vodka (which being a writer, I consumed without complaint).